There are many compelling stories about those impacting, and influenced by, life in Baltimore. Filmmaker Kobie Brown spent the spring & summer of 2015 documenting them in a series exploring race, class and justice in America. In 1967, then President Lyndon Baines Johnson commissioned a committee to investigate and report on the causes of that year’s race riots, and to offer recommendations for the future. What he received the following winter is often referred to as the Kerner Report. Many things can change in 47 years, and many things can remain the same. Watching the events surrounding the death of Freddie Gray unfold on television this spring left me perplexed. Baltimore is the largest city in Maryland, the wealthiest state in America. The city has a black mayor. During the time of Gray’s death and the subsequent uprising, the city had a black police commissioner. And the majority of Baltimore’s city council members, charged with ensuring the city fulfills its duties under the law and lawfully exercises its powers, were also, as 63 percent of the city’s citizens, black. So how, in the context of so many outward signs of advancement in America’s race relations, could a young black man die as such, or an uprising of epic proportion ensue, only 47 miles from the steps of the White House? The arrest and subsequent death of Freddie Gray was the fuse that gave life, and an international audience, to an explosion of frustration and resentment. Proximity provides perspective, and this odd set of variables compelled me to take several trips to Baltimore to see, learn and touch the matter for myself. What I discovered beyond the inner harbor were the lives of people impacted by and impacting life in the city. The experience presented indelible reminders that what exists within walking distance from the city’s glowing harbor might as well be a world apart. For those who’ve seen and can identify with that world, the trial of each of the officers indicted in Gray’s death is about far more than what occurred that fateful afternoon he was detained by the police. The trials symbolize a legacy of failed relationships between police officers and the communities they ostensibly serve; a legacy that has grown increasingly divided by a line cast, often in blood, upon racial lines. According to its special investigation series seven months before Gray’s death, the Baltimore Sun uncovered 317 lawsuits charged to the city over allegations of police conduct since 2011, many of which led to settlements with citizens totaling 5.7 million dollars. The series won an award, but the depredations revealed in black and white couldn’t prevent Gray’s death or his becoming a more public example of the brutality and civil rights violations experienced by a 15-year-old boy riding a dirt bike, a 26-year-old pregnant accountant, an 87-year-old grandmother, or citizens like Tyrone West, who died in the hands of Baltimore City Police. Autopsy results reveal Gray suffered a severed spine while in police custody, but attacks on humanity aren’t always physical. As for the signs of physical harm, or even death that could potentially befall a black citizen when he or she encountered the police - whether innocent or guilty of committing a crime - the writing had long been on the wall. The CVS destroyed at the corner of Pennsylvania and North received a great deal of attention. For many, that attention was accompanied with questions of why anyone would burn their own neighborhood. My trip beyond the harbor revealed very few neighborhoods, and an overabundance of concentration camp-like conditions that served as a veritable powder keg that led to the city’s explosion. 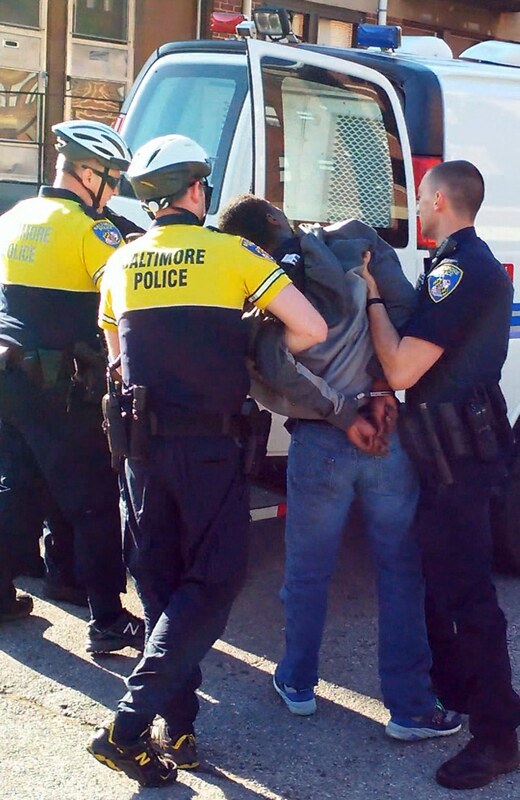 The arrest and subsequent death of Freddie Gray was the fuse that gave life, and an international audience, to an explosion of frustration and resentment that are as prevalent as crime and unemployment are in any impoverished state. Autopsy results reveal Gray suffered a severed spine while in police custody, but attacks on humanity aren’t always physical. Those who live beyond the harbor often find the public schools to be a place where they are first set upon, and insidiously so. The attack on human potential for many beyond the inner harbor is most evident in the budget shortfalls of the city’s public schools juxtaposed to State official’s approval to build a $30 million jail to house Baltimore teens. During the spring, Rev. Jamal H. Bryant led a protest whereby he demanded Maryland’s Governor, Larry Hogan, reverse funding for the jail and pump $11 million more into the city's schools. The reversal hasn’t yet happened. American politician and educational reformer, Horace Mann, described education as “the great equalizer of the conditions of men, the balance-wheel of the social machinery.” The near-perpetual shambles of facilities and materials in Baltimore City’s Public Schools described by Emily Wilson, a former schoolteacher, reveals that Mann’s proverbial wheel has long been unbalanced in Baltimore. A balanced thinker can’t help but consider how many kids have been maneuvered into criminal justice system after being ignominiously defeated by the conditions beyond the harbor, as well as public schools that became the first stop on their way to a life of potentially limited opportunities. Behind the veil of privilege, the trials of the officers will determine their guilt and culpability in Freddie Gray’s death. Conversely, a bit of research revealed the $1.8 billion dollars The City of Baltimore received from the American Recovery and Reinvestment Act (ARRA), commonly known as the stimulus, $467.1 million of which was earmarked to invest in public education prior to the uprisings. Traveling beyond Baltimore’s glowing harbor puts you in greater proximity with the understanding that, seven months after Gray’s death, its citizens are pregnant with the possibility of validation and restorative justice. A common occurrence now presents the chance of recovering the demoralizing loss of black lives, and all that accompanies segregation, economic impotence and levels of poverty that continue to create conditions totally unknown to most in America. The number of people living in high-poverty areas like Baltimore has grown from 7.2 million to 13.8 million since 2000. The deaths of Freddie Gray, and Laquan McDonald (the latter of which was not fully disclosed until a year after it occurred) are just two examples of a growing number of extra judicial killings of blacks in America. Forty-seven years after The Kerner Report, those who live in front, or behind, the veil of privilege need only to explore beyond the harbor to discover the verdict is already in on our collective perspective on race, class and justice in America. Kobie Brown is an entertainment executive by trade, with a passion for writing and creating film.